Palladium bullion is a precious metal that is often overlooked by most investors, and this can be a big mistake. Silver and gold bullion are well known to investors, and are very popular choices. This is not true for palladium, but this precious metal can be just as good of an investment as other types. 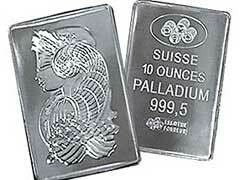 Unlike some precious metals, palladium bullion has many industrial applications. This metal is very rare in nature and belongs to the platinum group of metals. Palladium can be used in auto-manufacturing, electronics, water purification and even in medical field. Palladium bullion has reached more than one thousand dollars per ounce in the past, and could surpass this mark in the future. The demand for this bullion fluctuates, and all of the commercial applications this precious metal is used for can cause the value to skyrocket. Investors who overlook this precious metal may be making a big mistake, and missing out on an excellent investment. Palladium bullion is a terrific opportunity for investors, and can be just as good of a choice as gold bullion or silver for that matter. The gold bullion market is viewed by investors as a great choice, but palladium coins can be just as lucrative, and can be an ideal investment option. Investors can choose among a plethora of bullion products like Canadian Maple Leaf coins, palladium rounds and bars. If you buy at least 10 oz of bullion products, you will qualify for discounted pricing and lowest available premium costs. Palladium bullion has so many commercial uses the demand for this metal will probably continue to rise, meaning that it can be a very profitable investment. This metal is also used by many countries in currency and coins, which also drives up the demand and the value of the metal. These coins can be just as valuable as or gold bullion coins, but they are often ignored because many investors do not realize the potential that palladium offers and the market is not currently saturated with palladium bars or coins. It’s fair to say that these precious metal coins are definitely less popular than other previously discussed metals among investors and numismatists, however, they can rightfully take a place in virtually any investment portfolio. Acquire a few of these bullion coins or bars as a great diversification mechanism.